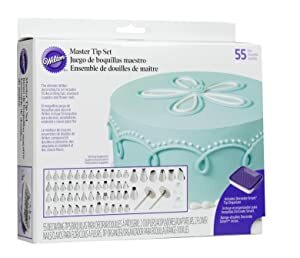 Always have a wide selection of decorating tips readily available with the Wilton Master Tip Set with coordinating tip organizer. Holds all 55 standard-sized tips and allows for nesting of up to three tips. All the tips you need to explore new decorating techniques using all of the tip families including, round, star, petal, leaf, ruffle basketweave, drop flower and specialty tips. Change tips easily without changing bags and making a big mess! This set of couplers are for standard sized tips and made of white plastic. 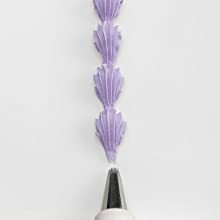 Provides the control you need when piping icing flowers. Just rotate the nail between your fingers as you pipe a flower on the head. Stainless steel.1 1/2 inch No. 7 Flower Nail. 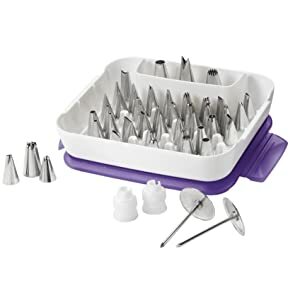 Always have a wide selection of decorating tips readily available with the Wilton Tip Organizer. Holds 55 standard-sized tips and allows for nesting of up to three tips. Separate compartment holds couplers, flower nails and oversized tips. The storage tray nests on its lid to maximize space and is angled for easy viewing. Stacks conveniently with Icing Color Organizer (sold separately). 8 x 6-1/2 x 1-3/4 inch plastic tip organizer. 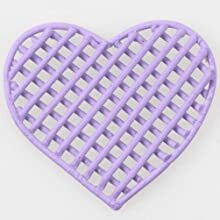 Tip 2 is perfect for piping fine details like lattice work or writing messages on your cake. Traditional shell borders create a finished look. The iconic border is perfect for encircling the bottom of your cake. 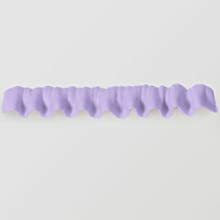 Tip 104 used here, but you can use any of the 5 included ruffle tips to create this effect in varying sizes and widths. Tip 47 used here and gives the iconic textured look. 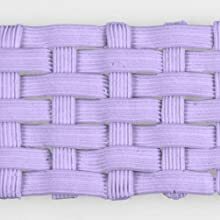 Use the basketweave tip to add texture to the sides and top of cakes.